As we were putting the finishing touches on The Last of Us: Remastered a couple of months ago, we couldn’t wait to see the results from including Photo Mode tools in our game. In just the last two weeks since release we’ve seen some incredible output from our community, some of it even in video format! The gang over at NeoGAF have been extremely prolific with our Photo Mode, even hosting their own contest. You may have seen Grant Voegtle’s amazing The Last of Us trailer that was created entirely using Photo Mode. We’ve also seen a steady stream of great Photo Mode shots fill up our Twitter feed, and that’s just scratching the surface of what is being shared on a daily basis. We seriously have no words how awesome all these contributions are – the creativity and quality of your images has gone way beyond our wildest expectations. 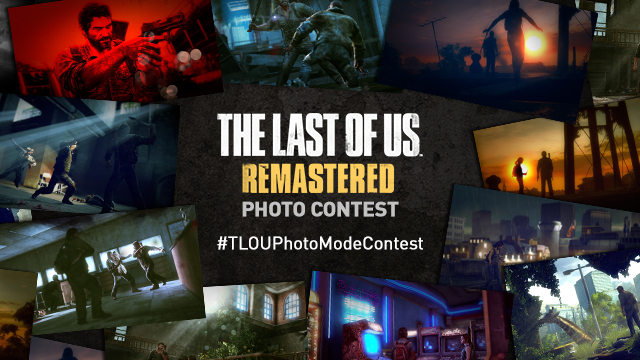 Now we want to give a little back to recognize and celebrate all these awesome images we’ve been seeing… Starting TODAY at 12:00 PM PST, we are running a Photo Mode Contest for The Last of Us Remastered! We’ve got some great prizes lined up including poster sized images of your winning photo signed by the Naughty Dog development team (!!! ), a Joel and Ellie statuette previously only available in The Last of Us Post Pandemic Edition, a digital copy of The Art of The Last of Us by Dark Horse, and more! You must be a legal resident in one of the 50 United States (excluding Arizona) or Washington, D.C. If you haven’t used Photo Mode before, watch this handy tutorial video we made for you. Be sure to read the Official Rules right away and then start sharing your Photo Mode shots. If you live in Europe – don’t fret, the PlayStation team over there will also run a Photo Mode contest in a few weeks. We’ll update you with more details when we have them! Interesting contest, but I live in CANADA. Can we CANADIANS get some love, please? Good luck everyone who is entering! And keep it up, Naughty Dog! We’ll talk to the PS folks up in Canada. It’s pretty challenging to put together a contest and ensure you’re following all the laws and rules – it takes some time. That may just be it. I don’t live there but why are Arizona residents excluded from this challenge? It’s all related to some legal stuff related to contests and things like that. I see Arizona frequently excluded from that. Is Puerto Rico also excluded? That’s what I understand but I’m still crossing my fingers so that we can participate. I’ve been able to participate in previous US Only contests…any particular reason why PR would be excluded? It’s only the 50 states (except Arizona but including Washington, DC) from what I read in the rules. I’m not aware of a specific reason, but I’m sure it has to do with how complex things get and how long the whole process can take once you go beyond US states and so on. Awesome. Took some nice screen shots of TLoUR last night! Interesting contest. I would participate, but I don’t “twitter”. Maybe just for this contest? You can always make it private or take it down later. @5: You should, if for no other other reason than all the contests thst occur using it. Why don’t make this contest in global level, Naughty Dog? We’ll try sometime and work with out Latin America team to see what we can do. We love Brazil – we have such great Naughty Dog fans there! @6 Elvick_ Exactly. That is the sole reason I started using Twitter. As to those whose place of resident is excluded in contest, it is due to State and National/International laws (be it copyright, games of chance, etc.). I never understand why people (not anyone in these comments mind you…yet) get upset with Sony and/or developers for something that is out of their control. Cool! but I’ve already taken nice shots and saved them to my Flickr account. They can still be shared directly from the photo/video app in the XMB — if you haven’t deleted them off of your PS4. I sent mine already, somehow got the camra icon in the corner…lol Will I need to send it again after 12:00? I’m such a rule breaker? Unfortunately you will. We have to follow those rules to make sure everyone feels they’ve been treated fairly (and we could get in trouble if we don’t), so if you want to enter, you’ll have to send it again. Sorry! If I don’t say “eh” and use the term “y’all” instead, can I pass as ‘Merican and enter? The images will still look pretty good for the purposes of this contest! Is it strictly for The Last Of Us or can we use Left Behind too? What’s the point of taking picture on the last of us if I can’t enter the contest! Just watched the Grant Voegtle trailer and actually it is awesome! Thanks for the recommendation! It is amazing isn’t it? Glad you enjoyed it! You can always just share awesome images to the world just because! I take a post a bunch of photographs on my own time just because I want to put them out there – I don’t enter contests to do that. Do these have to be pictures captured after August 15 at 12:00 PM PST or do they just need to be uploaded/Tweeted after that date? Man, I took the best picture earlier today too. I’ll enter some photos in this contest! Can we post as many pictures as we want or just one per person? Sweepstakes like these are why I love Naughty Dog, and the SONY platform. Such a great way to incentivize the use of photo mode, and benefit the social integration PS4 has to offer. Keep up the great work! I like the idea of this contest and it’s a great idea as well I might look into this. Glad I picked up the remastered version nd can’t wait for the dlc at the end of the month. Duuuuuude. As if I don’t have enough reasons to hate this state. I even took a bunch of pictures in anticipation of this contest… Gah. Would have loved to enter this, but I’m sorry – I really feel ND dropped the ball on this one. The fans that supported you to begin with – the ones who bought every ND game and Last of Us on the PS3 with the season pass, only to find out the PS4 version would be coming out for $50 and no discount at all to loyal fans, and then ND announcing they are working on more DLC (which is a GREAT thing) but I have a feeling it won’t be a part of the season pass, which means it will further disconnect the community from each other. This is my 2nd fav. game of all time……. but I won’t be buying it twice until it’s cheap this holiday season. Not really about the money – more about the principle. At the very least, the new DLC should be a part of the season pass AND players who bought the season pass on ps3 should be able to get the DLC on PS4 included in that season pass. Just my opinion :/ It wouldn’t have been hard to show some love to the huge fans of you who had the ps3 game ND. No end of Summer Buster Sales????!! Booooooooooo! I Should go to Microsoft and hand them my wallet completely. But I believe in you. You have until next update to surprise me. I feel the need to do some serious impulsive spending. I wish there could be a video contest for this game. Never been prouder being a Playstation and Last of Us fan living in AZ……. @maxvtec The official rules state that you can submit as many entries as you’d like. I am confused about the multiple entries part too because I would assume they mean that you can post an entry for each category but I have a lot of photos now and coming up that I would love to share lol. Sorry. I must be reading this wrong. So our photo can’t include the liquor store in hometown or, say, one of Joel’s guns?